It was on 4 September 2006 that the world's favourite crocodile hunter, Steve Irwin, succumbed to his injuries after a stingray stabbed him in the chest multiple times. His legacy lives on in his 18-year-old daughter, Bindi. 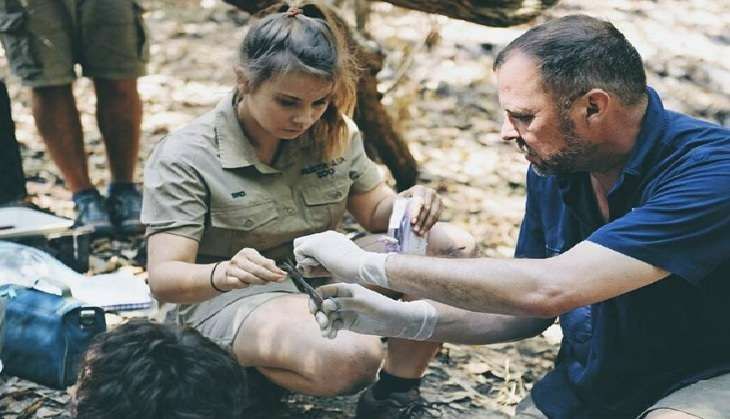 Like her father before her, the teenager has also devoted her life to rescuing crocodiles and other animals. However, unlike Steve, Bindi is a millennial who likes to chronicle her trysts with the wild on social media. Her latest Instagram post depicts her capturing a massive crocodile, with the help of other wildlife experts, using a technique devised by her late father. CRIKEY! Check out Big Dunc on the #CrocTrip2016 🐊🌿 Our highly experienced @AustraliaZoo Croc Team uses the very same capture techniques that Dad developed so many years ago. Our team leader, Toby Millyard was trained by Dad himself and continues to help us carry on in his footsteps. We truly have the most elite team when it comes to catching crocs and we all share the passion of protecting crocodiles as well as educating others. These techniques have allowed us to safely capture crocs such as Big Dunc. Big Dunc is a whopping 15 feet 1.5 inches of sheer power. He is currently the largest crocodile we are tracking in the Wenlock River. This is the third time Big Dunc has decided to stop by for a free meal and to say g'day to our team. Somehow he manages to seem bigger and bigger with each visit. Big Dunc is just one of the 146 (and counting) crocodiles we are currently tracking throughout the Wenlock River. The video has garnered some amount of hate, with some users lamenting the 'cruel' method used to capture the animal. Others have jumped to Irwin's defence, saying that rescue missions such as these are crucial to ensure that crocodiles and other wild animals don't become victims of mindless poaching. It is indeed heart warming to see that the next generation 'Crocodile Hunter' is already on a roll. I'm grateful for each moment and the life I have been given to lead. I hope every day that I'm able to empower more individuals to stand up for what they believe in, and change the world. We have one planet, one chance, to create a beautiful future, for those yet to walk in our footsteps.